Other than Baba, the character the most disappointing is easily Chudo-Yudo, who is an immortal dragon masquerading as a dog. Other than having the ability to speak, there really isn't anything unique about Chudo. For the most part, he acts exactly like you would expect a dog to, even at times when it is just him and Baba. Chudo slobbers, eats bones and loves to be petted. He could have been a really interesting character but he simply fell flat. Blake reminds us repeatedly that Chudo is an immortal dragon and this is absolutely necessary because at not time does he act like it. Similarly, all of the other characters are flat and not well fleshed out. The antagonist is simply bad because she seeks power, though her motivation is retribution for the human destruction of water - her natural habitat. There is absolutely no nuance to her. The Queen of the Otherworld is angry, which irritates me because a woman in power need not be a shrew. The rest of the characters all seem to blend together with no distinction. I cannot even remember their names, which should indicate the degree to which they interested me. Blake's Baba Yaga series is a twist on the Baba Yaga folkore. She movs the story from Russia, converts the mortar and pestle into a BMW motorcycle and the chicken hut into an Airstream. With all of these changes, you would think that Blake would have gotten around to adding a little bit of diversity to her story but alas, that is not to be the case. All of the characters in the novel are straight, White and able bodied. It is about as exciting and diverse as a loaf of wonder bread. I went into Wickedly Dangerous with such hope. It's not often the Baba Yaga makes an appearance in urban fantasy, and even less often that her folklore is reworked to fit a modern world. What I got is a sappy erased romance which worked its way to the big HEA, with a bit of a mystery thrown in for the pretense of a plot. Instead of getting a highly competent, smart and even dark protagonist, I got a sappy lovestruck bore. 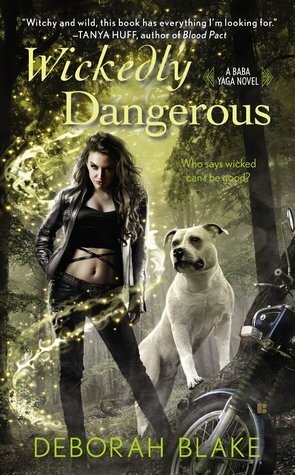 By the time I was 1/3 of the way through Wickedly Dangerous, I wasn't even sure I would finish. With each page that I read, my hopes got dashed and I realised there's nothing new, or exciting about this series. Read at your own risk.